When Zero Dark Thirty (the cinematic depiction of the decade-long manhunt for Osama Bin Laden, following the 2001 terrorist attacks) opens, CIA Interrogator Dan (Jason Clarke) is acclimating the wilful and determined Maya (Jessica Chastain) to the harsh realities of torture. Waterboarding, beating and humiliating the Al Qaeda suspect, he puffs out his chest and asserts, "I will break you." Maya is visibly disturbed by the process but asserts, when confronted with a plea by the suspect, "You have the power to save yourself by telling the truth." It's a mantra she reiterates with suspects throughout the film, realizing the futility of alpha-male posturing and aggression as confessional instigators. She's aware that the male ego can be manipulated with flattery and a sense of control, no matter how tenuous and transparent that control might be. This is why her later exploitation of the tortured suspect — using information about a terrorist attack he'd be unaware of from his 24/7 cage — helps open up the door to a theory that suggests the key to finding Bin Laden is in tracking his most trusted courier, Abu Ahmed al Kuwaiti. As usual, Bigelow's treatise on gender roles is masked by an impressively honed visceral component, dropping character-defining conversation in favour of reactions, exposition and propulsive filmmaking. Maya's relentless pursuit of the courier and her countless clashes with egocentric male authority figures suit Bigelow's career-long assertions to a tee. This is captured poignantly in a scene where Maya is trying to convince her scientifically driven male counterparts of her intuition, stating, "I know how much certainty freaks you guys out." While the men involved in the case bark orders and concern themselves with seating arrangements at tables and petty, time-consuming arguments, Maya pushes her agenda through, focused only on the endgame amidst the grating political posturing. 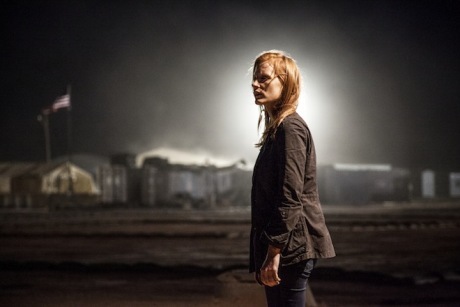 But the great thing about Zero Dark Thirty is that these gender divides aren't quite so overt in the moment. The investigation and endless series of setbacks and roadblocks drive the story forward, as do the unexpected and wholly intense terrorist attacks and assassination attempts that pop up throughout. There's an engrossing feeling of being in-the-moment and sharing in Maya's manhunt that generates a sense of immediacy, culminating in the expertly choreographed, and inevitable, compound raid. Moreover, Bigelow is careful not to reduce her gender role deconstruction to glib assertions about who is better. While the men act as impediments for the majority of the film, they also tend to know when to step back from a situation to preserve their well-being. The women, both Maya and her CIA ally Jessica (Jennifer Ehle) — to whom she introduces herself by one-upping her mentally in true passive-aggressive fashion — are flawed in their trust and focused determination, leaving them each to confront the realities of their assertions when they realize that being wrong about something could result in the unnecessary elimination of a human life. It's these subtleties of character and motivation — most of which are detailed through reactions and facial responses rather than words — that add a cerebral dimension and emotional element to the already stellar thriller component.